Domain Authority (DA) is a metric that an independent and privately-held software company, (Moz), has created to help quantify the authority of websites. This, in the past and somewhat now, is a good way for marketing professionals and SEO experts to understand their potential to rank higher in search engines like Google. The most influential variable in Google’s ranking algorithm is the quantity and quality of backlinks that are currently pointing back to your site. Since Moz is able to put a metric on the authoritativeness of a site, it is a widespread belief among many SEOs that backlinks from higher domain authority sites will result in more authority being passed to the site they’re linking back to. That being said, it is quite difficult to target specific items that will contribute directly to improving your domain authority score. While one can make technical changes such as updating metadata and changing page titles, increasing your Domain Authority according to Moz’s metrics should never be an end-goal. Here’s why. Whenever tools like Moz, Ahrefs, SEMrush or many others create a metric around domain strength and domain ranking potential, what they’re really trying to do is replicate the PageRank metric Google had in place before they hid this metric. PageRank was Google’s official way of measuring the importance of websites similar to how Moz is attempting to measure authority with Domain Authority. Ahrefs uses a metric called Domain Rating which is similar to Domain Authority in the sense that it is on a logarithmic scale of 0-100, yet the company uses an entirely different equation to come to their number. Moz’s domain metric, Domain Authority, has a score that ranges from one to 100, with higher scores corresponding to a greater ability to rank. All things being equal, a page on an authoritative domain will rank higher than a page on a domain with less authority. There is no ideal Domain Authority, since it varies between industries and markets. Some say that Domain Authority is a distraction for SEOs, which honestly makes sense. This is aligned with how Victorious views the metric as a trailing metric rather than a leading one. One of the main reasons why we don’t use Domain Authority as a leading metric is due to the relationship between a changing metric and it’s influence on a website’s rankings. The domain authority update (DA) 2.0 was rolled out on March 5th, 2019 and aims to provide a more trustworthy measurement by removing paid and spammy links previously created to game the old Domain Authority. Before we get into how this new third-party ranking system is different, let’s get the correlation-versus-causation objection out of the way. Domain Authority does not cause search rankings. It is not a ranking factor. Domain Authority predicts the likelihood that one domain will outrank another. The relevancy of the content in which the link is being placed is the single most important consideration that comes into high authority indexed backlinks. There is a current issue among the SEO community that puts too much weight on the Domain Authority metric when determining which domains would cause authoritative backlinks for their website. You cannot determine the authority of a backlink on one metric, let alone a few. This aside, let’s get into what Moz has shared on the change to DA 2.0. In Moz’s official release of DA 2.0, they go over exactly how they want their followers to understand the change. This mainly includes their answers to the question of: “Why did my Authority change?” which is the natural first reaction to the hearing of the change. Compare changes in your Domain Authority with your competitors: If you drop significantly more, or increase significantly more, it could indicate that there are important differences in your link profile. Compare changes in your Domain Authority over time: The new Domain Authority will update historically as well, so you can track your Domain Authority over time to determine what Moz believes to be happening in your industry. If your DA is decreasing over time, especially relative to your competitors, you probably need to get started on a robust backlink outreach strategy as your competitors’ efforts are now being recognized even more now. Assess link quality when looking to acquire dropped or auction domains: Those looking to acquire dropped or auction domains now have a much more powerful tool in their hands for assessing quality. Of course, Domain Authority should not be the primary metric for assessing the quality of a link or a domain, but it certainly should be in every webmaster’s toolkit. Notice that using Domain Authority as a leading metric for backlink building strategy is not a consideration. Domain Authority is something to look at when you’re assessing your own site’s quality relative to your competitors. It’s not something that should be used when assessing the quality of the backlinks you are building to your website. There is no metric that quantifies the variables that truly define an authoritative link. Heck, if there was, then our job would be a lot easier and almost anyone would be able to identify a quality link by the flip of a hat. If you want to learn more on this, check out our blog post that describes what a quality backlink is. 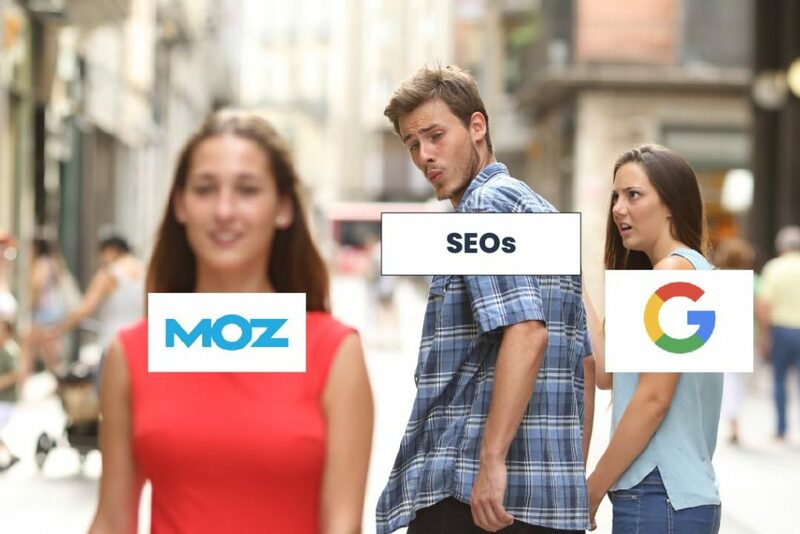 Something to definitely note is the fact that, again, Moz is a third party company who has no effect on how you rank in search. Google has and always will be the exclusive algorithm marketers on which marketers should focus their energy. If you’re not going about backlink building in the way described above, that’s where the Moz DA 2.0 change may come in to affect your rankings in an indirect case. We also have a comprehensive guide to how to improve your site’s domain authority. The DA 2.0 change has caused a lot of controversy in the SEO space. The majority of people that claim to have even some SEO knowledge believe that this change has had a fundamental shift as to how SEO works. This is a result of good marketing by MOZ to make marketers believe the Google algorithm and the MOZ algorithm are one and the same. If you were not following best practices when it comes to how to build backlinks, then yes, this could have a large impact on the actual quality in Google’s eyes of the domains you target in your backlink building efforts. On the other hand, if you recognize the distinct difference between Google’s algorithm and 3rd party (not to mention for-profit) companies’ metrics, then really nothing has changed. A bit of applause is due to Moz for engraining such a supposed fundamental metric in most SEO’s minds. In the case of Domain Authority and Moz, the power of good influential marketing is clear here. The response from the SEO community has been filled with a large range of opinions with the DA 2.0 change. While some may say that this is common in SEO, the buzz is certainly worth a share. We’ve seen tweets from folks sharing their thoughts saying that the metric is B.S. and made up, all the way to mentions of how Domain Authority is really our only option for an authority metric. Domain Authority is a metric created and marketed by arguably the most popular company in the search space. However, they are not Google. MOZ does not have any influence on the actual ranking algorithm and DA does not change how your website ranks in Google. The change to DA 2.0 has no effect on your Search Engine Result Page (SERP) results. It is always going to be in your best interest, whether there is a change made by Moz, Google, or any other company, to follow what has worked for your site in the past. Rely on content quality in your backlinks over any other metric, and you will not have any issues with this new switch. Most importantly, if you have been raised in your SEO upbringing to rely solely on Moz’s DA metric for assessing the authoritativeness of a website, you will want to reassess your thoughts here. Ask yourself – who actually has say in Google’s algorithm?